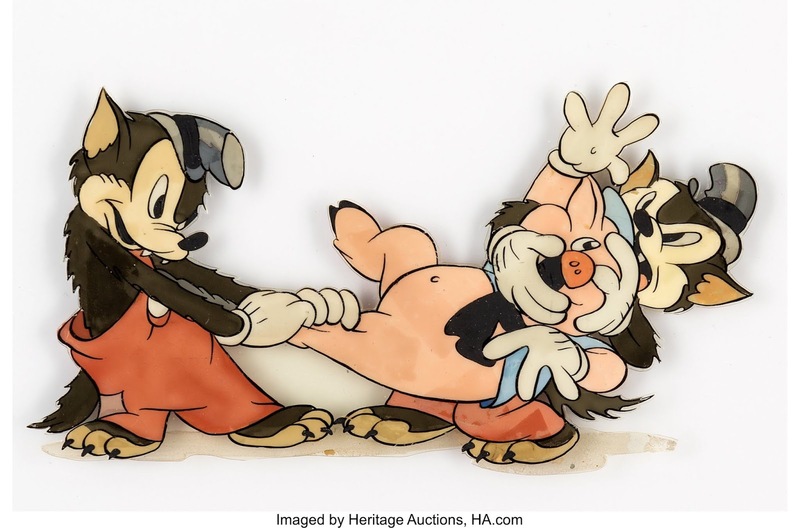 I just love this cel from the Silly Symphony Three Little Wolves from 1936. There is little doubt that Fred Moore animated this scene, in which two little wolves pester one of the pigs. The whole situation is child-like without being childish. The staging of the scene is so beautiful, two bullies messing with one of the pigs. I have a big smile on my face looking at this image, because Naughty meets Innocence in a very entertaining manner. You just want to smack these two brats and have them leave the pig alone. But there is something special about this cel, because the business of the scene is truly based on real situations. I wished that entertaining, graphic animation like this still existed.